My coat line started while living in Hawaii, for women of all sizes. 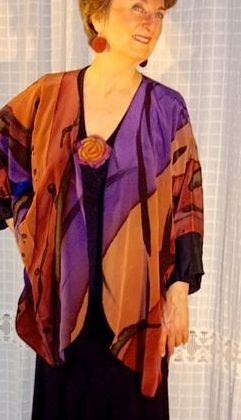 Each coat is individually Hand Painted on Silk, is my canvas to create a Unique - One Of A Kind art piece for each unique garment. My coats have been " MY TRADEMARK " , that represents my transition over the many years through my artwork. & techniques. My 3 Dimensional brush stroke with glitter paints creates a unique quality to the garments and accessories that has been my trade secret. * If you have a favourite palette of colours, I would be excited to create that special garment that is tailored to your taste, lifestyle and personality. Enjoy !